Creativity is about more than ideas — it is also about the consequences those ideas have for your story. I chose the word “experiment” in the title of this blog because experiments focus on finding or exploring cause-and-effect relationships. I realize that a consequence is a kind of idea but thinking about an idea’s consequences also can trigger more ideas. Ask questions about the idea to expand on it. How can you justify it (motives and backstory)? How can you tweak it to have more impact on your character? How can you make it more original? What effect will it have down road on the main character, other characters, or on setting? Mix-and-mismatch. Yes, mismatch. Many people’s early brainstorm lists will have simple ideas. Combine items from your list to make the idea more multi-dimensional. Give special attention to items that seem contradictory or unrelated (like that “octopus apple”). Come up with one or more ways to combine them — the more interesting the better! Sounds a lot like brainstorming, doesn’t it? Triangulate. An example of this is if you have been brainstorming conflicts for a chapter. Divide your chapter into a beginning, middle, and end. This gives you three key conflict points. Choose conflicts from lower down on your list (after the clichés have run out). They don’t have to appear to be related on the surface. If the three crises do not appear related, so much the better — you are more likely to surprise the reader. Just be sure to link them in a logical manner! With triangulation, the first two crises can seem unrelated (as long as they intensify) but they need to join forces to cause the third crisis. Remember, it is context and character reactions that decides the intensity of each crisis. After you brainstorm, you can take one or more ideas and use that as a seed for more ideas by looking at effects on character, conflict, or setting (or some other element like theme). 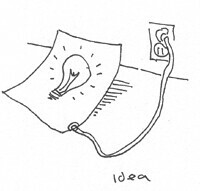 You also can combine ideas to create a new product. And you can take existing ideas to see how they relate. All this is really just a more advanced form of the basic brainstorm. What are some strategies you use to increase your creativity off of a basic brainstorm session?